Kindergarten has finished their PLTW lesson on Structure & Function of the Human Body. Over the last few weeks The students listened to a story about Angelina's experience of falling and breaking her arm. The students explored the basic relationship between structure and function in the human body. they had to identify major structures and organs within the body and investigated the relationships of the structure and function of each organ as well as identify the functions of bone. 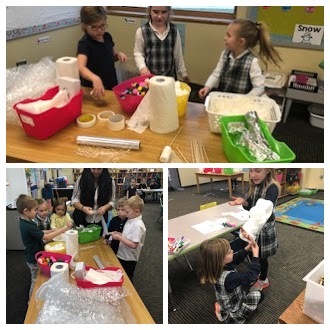 Then, they acted as scientists to perform an inquiry investigation to explore how the structure of the fingers impacts their function, as well as other activities with the skeleton and x-rays. Finally, the students exemplified their work through an engineering design process to design and build a cast for Angelina. The kinders had a great time and can not wait until our next PLTW lesson! !